Much of the research I've been doing explores and defines the ways we read visual information. The ways we understand it and the meaning applied by us and the artist. These themes have arisen in researching Heidegger, Derrida, Danto, Bell, Hume, Kant and others. This has led to a particular interest in the ways we read paintings. So I today spent the day in the workshop cutting up two canvases to explore the practical idea of turning a painting into a book. Highlighting the ways we read paintings, and forming a new way of exploring a work. The first test was done with a painting straight off the wall. It has a solid layer of primer (probably about 4 coats) and a mix of acrylic and oil paint on the surface. The template for this book is 19x40cm to make a book 19x20cm wide. The second is with an unprimed canvas that was placed on a studio floor for two months. Acrylic paint and dust cover the majority of the surface. This canvas had previously been stretched and nominated as a painting. I applied a single layer of acrylic sealant to either side. The template for this book is 36x25 to make a book 18x25cm, this measurement is taken from an art theory textbook, which generally have slightly different ratios to other books. My aim for this process is to discover the best way to turn my floor piece (see here) which is 9x2.5m into a book. The pages will be the size of a traditional painting (which one I am not sure at the moment) and I don't yet know whether it will be displayed horizontally or back onto the wall. Both tests should work through the next stage (binding) but the sealed canvas (experiment 2) has a tactile quality that is hard to define. The sealant has a plasticity that primer cannot achieve (due to the addition of pigment) and is something that encourages the viewer to flip through the pages of the book. It is a pleasurable experience. I am going to have to decide whether the work will be shown on the wall or on a plinth as this will define the size of the pages. For now, the binding experiments will continue with these two smaller books. Cutting the pages, in a double spread, using a metal template and mortuary blades. Quills grouped into sets of two, due to the thickness of the canvas and paint. Ready for binding. Book experiment 2, with acrylic sealant. Ready for binding. Ally McGinn (2017) Studio documentation. .....a physical deconstruction of canvas. These stages of exploration were undertaken in the paint workshop. Beginning with a pair of scissors, i had to cut across the weave of the fabric, in small sections, to best ensure the chances of the material separating. The resulting pile was run through a blender, a tiny section at a time worked best in this case. The blender had to be manipulated and turned on sporadically to allow the material to spread and not gather at the bottom. The resulting deconstruction is surprisingly fluffy. I could not remove all threads, so initial tests were done with these still inside. I am currently searching for more effective methods of reducing the fabric. Some of the deconstructed canvas was placed into the milling machine overnight to see whether the ceramic crushing would help reduce the material further. It was predicted that it would begin to felt the material back together. The above image shows the result. On the far right is the 'lump' that came out of the milling machine in the morning. Upon consideration there is a chance that adding less into the milling machine might yield different results. which is something to come back to later as it is unlikely. The next stage was one of my primary interests, attempting to turn canvas into something that can be either painted or sculpted with. Initially it was mixed with Alkyd Resin and a small amount of turps, in a pestle and mortar. When mixing paint in this way we are looking for the dry element to absorb all the moisture of the medium and then become suspended within it. In this case we achieved a small degree of success but not particularly encouraging that we would make a successful paint. We tried a small section of that mixture with a beeswax/damar resin mix (50:50). Using a mulling plate (with a small amount of blue pigment residue on the surface, which is where the colour has come from. Something i personally love) i mixed the paint with a palette knife and time. The mix of beeswax/damar to alkyd/canvas did not appear to make a difference at this point, it might when drying. I would predict that it will take longer for the 70/30 mix to dry, given the slow drying qualities of beeswax. 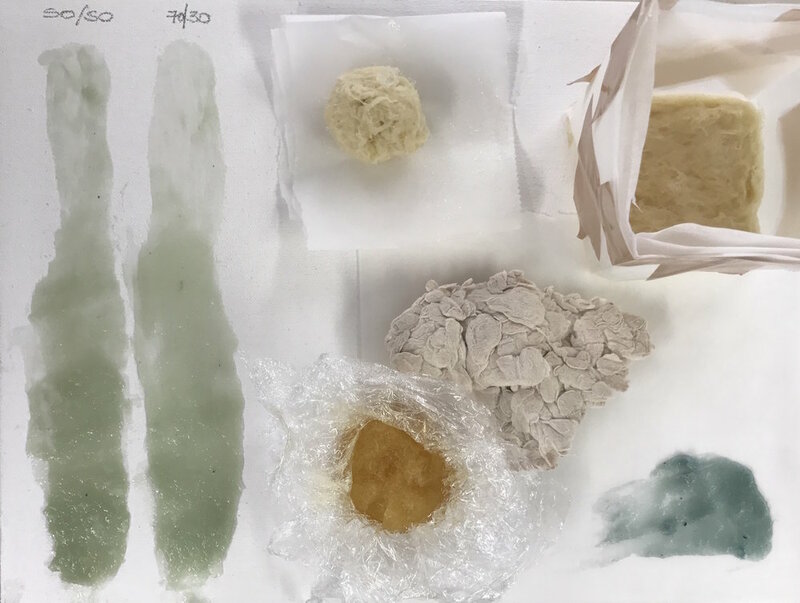 The final mix in this first round of testing was the fibre mixed with stand oil (which is given its name due to the process of leaving it to stand in large trays during production) and a small amount of siccative (for its drying qualities). This mix is the most promising, in terms of sculpting. I made two batches, one formed into a ball and the other into a cube shaped 'mould' made from greaseproof paper. Im going to be testing a few other ways to reduce the canvas fibres. Putting them in the milling machine was promising, a small amount of dust was produced - which is what we would ideally be looking for. The difficulty of this process is its authenticity. Once we get to a certain point with mediums then the material created may be a vehicle that contains canvas, as opposed to the preferred, canvas made into something else. I will be continuing my experiments making paint from unwanted 'things'. Begun last year with paint made from studio dust. Initially i plan to collect dust from the three studio bays at Dartmouth Avenue to examine the differences in colour once processed into paint. Nothing this time, other than the research goldmine that is the paint workshop at Bath Spa and its technician, Tim Davies.